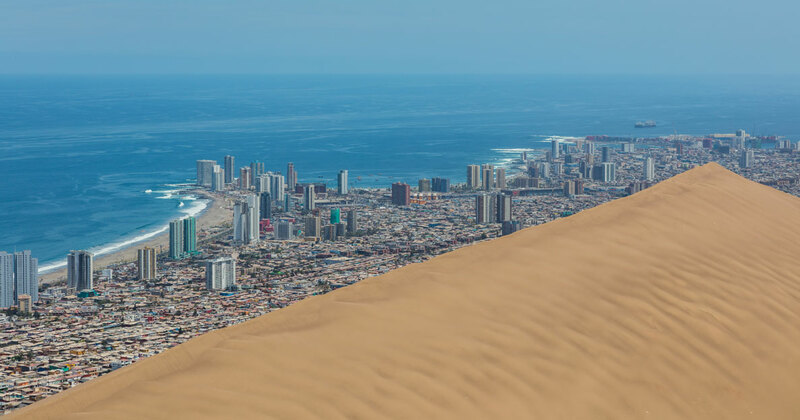 In the city of Iquique, in northern Chile, lies a 20,000-year-old sand dune that was originally formed by coastal winds when the sea level was once 100 meters further inland. Dubbed Cerro Dragón (‘Dragon Dune’), it measures 6.4 km (4 mi.) long, 320 m (350 yd) high and ranges between 150 and 500 m (160-600 yd) wide. According to Wikipedia, it was officially named a Natural Sanctuary in 2005 and is considered stable; a comforting thought for the 185,000+ residents below. To see the full resolution, 8599 × 4461 pixel photo, click here. Photograph by Diego Delso.